January | 2014 | Hike. Camp. Hike. 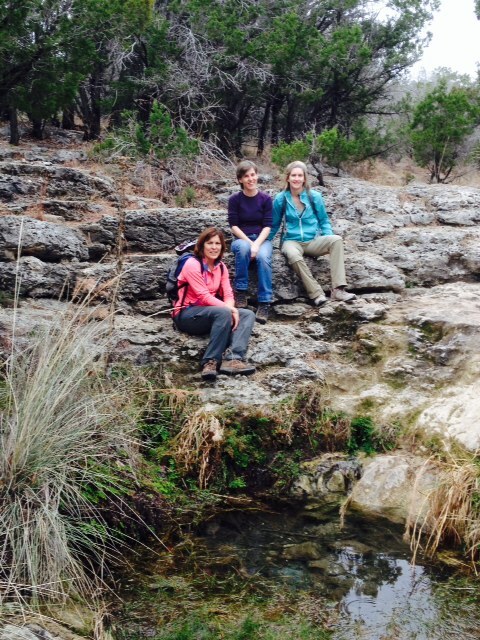 Sunday hike along Trammell’s Crossing Trail. (L-R)Judy, Bettina, Maria. Photo by Suzanne. Campsite: We stayed in site #56. Sites 31, 33, 34 & 36 looked to be some of the best in the park but they were taken when we arrived. We had reservations but you can’t reserve a specific site. We are finding out that if you want to camp anywhere in central Texas, reservations are a good idea! Saturday Hike: Wolf Mountain Trail, 6 miles. The trailhead is not far from the park headquarters. This is the only trail that the park describes as challenging but it was about the same or maybe even easier than the Trammell’s Crossing loop we hiked Sunday. Sunday Hike: Trammell’s Crossing Trail, 6 miles. Trailhead is between campsites 33 & 34. Watch out, we had to cross the river and it was freezing and slippery! A great hike! If I only had time for one of these two trails, I’d choose the Trammell’s Crossing Trail. Here’s a link to the Trails Map and the Park Map. 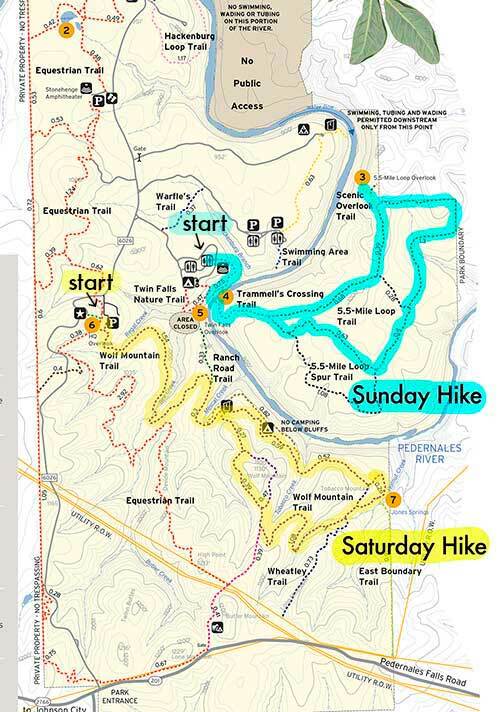 Below is a detail of the Trails Map with our hikes highlighted. Bird of the Trip: Ladderback-backed Woodpecker – we visited the Bird Blind and I highly recommend it! I’m so glad we have our birding expert Suzanne in the group, I would have probably never thought of visiting the bird blind without her suggesting it. This soup was seriously good and perfect for a cold night under the stars. Thank you Bettina, your home-grown broccoli was delicious! Equipment highlights: We were impressed with the performance of my new Baja Burner stove by snow peak. We also loved our new lightweight chairs – Maria has the REI Flex Lite Chair and I have the Alite Designs Mantis Chair. They were great for sitting by the fire! Bettina and Suzanne spend their first nights in their new backpacking tents by Big Agnes Fly Creek UL2 and gave them a thumbs up.